Northern England and Scotland provide the best returns for buy-to-let landlords, with some locations offering yields of more than 8%. Rochdale in Greater Manchester topped the table for the most lucrative place in which to be a landlord, with low property prices and rents in a two-bedroom home of £738 translating into gross annual yields of 9%. At the other end of the scale, the commuter hotspot of St Albans offered the lowest returns at just 3.7%, according to Zoopla. Annabel Dixon, spokesperson for Zoopla, said: “Despite the challenges facing the sector, yields - particularly in North England and Scotland - match up well against other forms of investment. On a regional basis, Scotland offered the best yields at 6%, followed by Yorkshire and the Humber and North West England at 5.4%. Returns were lowest in the South West and London at 4.2%. Where are the best buy-to-let towns? 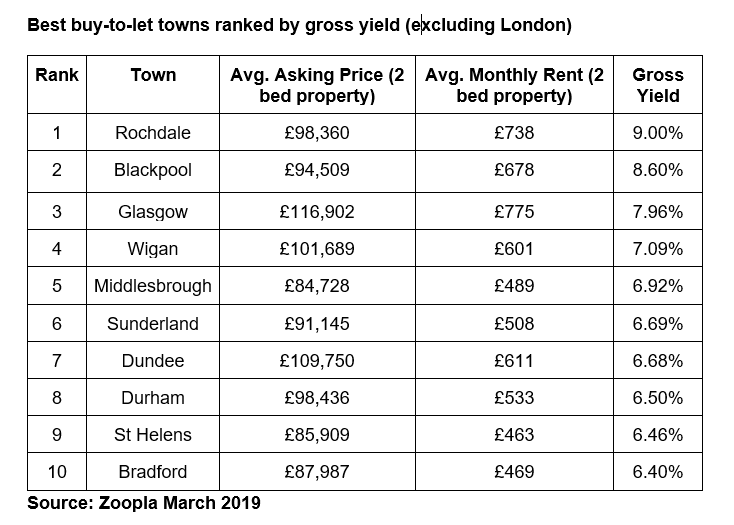 While Rochdale topped the poll for the best buy-to-let returns, Blackpool was not far behind offering yields of 8.6%, followed by Glasgow at 8%, with Wigan in fourth place and Middlesbrough coming fifth. Not only were all of the top 10 towns in northern England or Scotland, but they all had house prices that were significantly below the national average, contributing to the higher yields. Middlesbrough had the lowest house prices on the list at just £84,728, offering gross yields of 6.9% despite average monthly rent on a two-bedroom property coming in at only £489. Where are the worst performing buy-to-let towns? Outside of London, towns within commuting distance of the capital offered some of the lowest buy-to-let yields, largely due to high house prices. 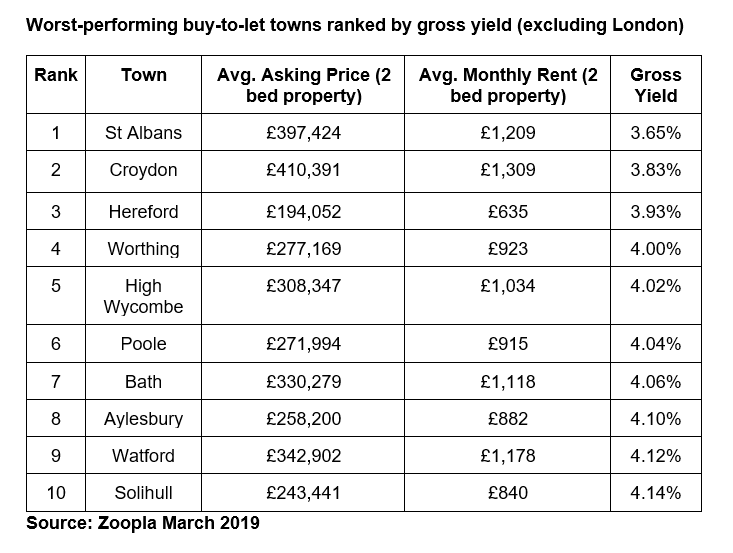 Although rent on a two-bedroom property in St Albans averaged £1,209 a month, typical property prices of £397,424 contributed to a yield of only 3.7%. Croydon was not much better, offering average returns of 3.8%, while yields in Worthing and High Wycombe were just 4%. Hereford offered the third lowest yields at 3.9%, reflecting low rents of only £635, despite a two-bedroom property in the town costing just £194,052. Unsurprisingly, high house prices in London put pressure on the rental yields buy-to-let investors could expect to make. Despite this, there were still pockets of opportunity in the capital. 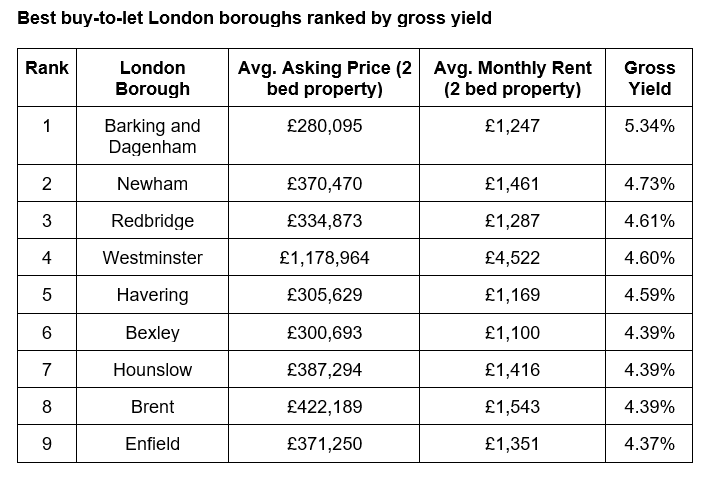 Barking and Dagenham offered they highest yields to landlords at an average of 5.3%, followed by Newham at 4.7% and Redbridge at 4.6%. By contrast, returns were lowest in Hackney at just 3.3%, despite rent on a two-bedroom home costing an eye-watering £1,933 a month.